When Deb e-mailed me to ask if I wanted to join in on this years’ Summerfest, I was all in. It’s a cross-blog food event that celebrates the very best fruit and vegetable bounty that the Summer season has to offer. This is the third year of Summerfest, but my first time joining in the fun. Every Wednesday, participating blogs will feature the fruit or vegetable of the week (schedule below), so you’ll get a fantastic round-up of what to do with what your CSA or farmer’s market is bringing your way. What better way to get inspired? If you’d like to join in the fun, check out the directions below. The group of foodies participating in this weekly event is a great Who’s Who of the food blogging and even TV world (hello Food Network and Scripps folks!). Below is the list of who is writing about CukesnZukes this week (posts will appear late tonight/tomorrow, so be sure to stop by and check out what everyone’s cooking, and get some awesome tips on what to do with your produce. So my contribution? Indian Cucumber Wraps. I first made these babies a few years ago, inspired by something an old neighbor shared with me. They are crazy simple to make, and nearly fall into my clean eating regime. In fact, so close that I allow it every now and again. Easy to make, satisfying and a great unique spin on using your cukes this week (recipe at bottom of post). Why size matters (and smaller is better). Pickling tips/tricks, and freezing the excess. On excess! Why I hate zucchini, plus pickling commentary and Summer Squash Bread Pudding recipe. On Prosciutto, Sour Cream and Feta Stuffed Cucumbers. Cucumber + Sesame Salad, along with step-by-step photo illustrations of cucumbers being sliced on a mandoline. Had this for breakfast. 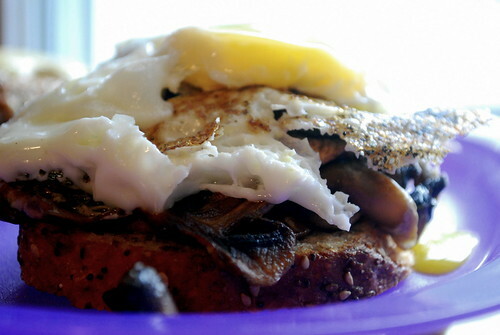 Toasted multi-grain bread, sauteed mushrooms, egg. Delish. In a medium sauce pan, heat up a little bit of olive oil and add the cucumber and onion. Saute until they soften and add approximately a teaspoon of Besan, stir. Season with pinches of salt, pepper, sugar and Garam Masala to taste. Saute for another minute or two to give flavors a chance to marry. (As you can see from the picture, I let the onions get to the caramelized stage) In the meantime, put one Roti on paper towel in microwave for 15 seconds just to warm up and soften. 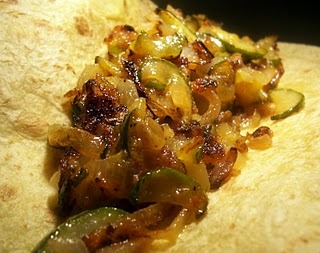 When done, fill Roti with cucumber and onion mixture, roll up and devour. I dipped in a mixture of part sour cream, part chutney, but it is just as good on its own. Happy to be able to get to know so many interesting blogs thanks to Summer Fest! As requested, let’s start cross commenting and visiting blogs! This is my post, a quinoa tart with raw baby zucchini and sun dried tomatoes! I love the idea of summerfest! No one should have an excuse for why they can’t appreciate summer produce, least of all that they “don’t know what to do with it”. This sounds like one tasty sandwich filling! here is my entry from Tuscany! Sounds like a lot of great recipes are coming up from everyone. Oohhh that looks delicious!!! My contribution to the Summer Fest is Cucumber, Feta, & Walnut. A very yummy and refreshing combination! Great Blog.. and great recipe ides. Wow, summerfest sounds like fun! I am excited to get a lot of new ideas and share some of my own. I’m a newbie blogger but really enjoying it so far! Can’t wait to try the other zukes and cukes recipe. This one is particularly intriguing. I’ve never cooked cucumbers with heat! I didn’t get to plant zucchini this year. But I happily find myself receiving zucchinis grown in friends’ gardens. What fun. Check out my post on Zucchini Pasta with Chicken…my favorite summer dinner! That looks so yummy. I’ve never tried cooking cucumbers but you’ve inspired me! Thanks for the shout-out! These wraps look great– and actually what I want right now, after having spent my day in a test kitchen. Wanna share? Check out my Marinated Summer Squash Salad and my Cucumber Salad with Lemons and Poppy Seeds at my blog, http://www.thewrightrecipes.com. 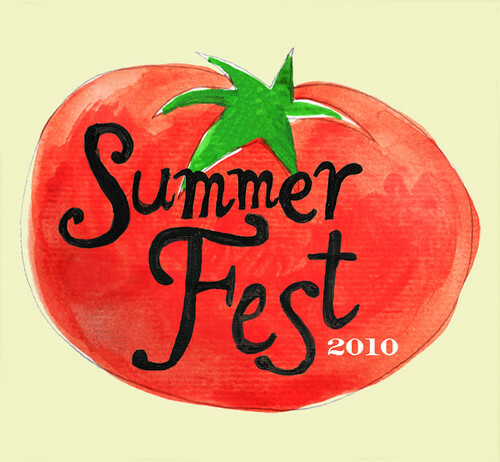 So happy to be feasting at the Summer Fest 2010 with you! Can’t wait to peruse the other recipes! I’m going to be eating our zucchini for weeks! wow, we love Indian food! These cucumber wraps are so fresh, definitely another great recipe to add to our Indian inspired recipe collection. those look delicious – what a fun and different way to prepare cucumbers! Our own plants are starting to go crazy and are practically growing in front of our eyes! I never actually considered dicing up cucumbers and sauteeing them–that seems like such a zucchini thing to do, but this is much more adventurous. I’ll have to try it, thanks! Those cucumber wraps sound delicious! I’ll definitely be making these tomorrow night! Have you ever thought about sticking in some protein though? I’ll probably throw on some chickpeas, specifically these seasoned ones from Tasty Bite. I’ve been throwing their Chunky Chickpeas in and on everything. Definitely give it a try – their whole line is vegetarian too. Thanks for the great recipe and bon appetit! I’ll let you know how mine turned out.